The cloud of smoke you see wafting out of vehicles and projecting into communal areas is no longer just from cigarettes. It also comes from a shiny and often colorful, yet discreet, e-cigarette. ENDS (electronic nicotine delivery systems), e-cigarettes and vape pens were first introduced in 2003. Since then, sellers have advertised the product as an alternative to smoking and an agent to help persons quit smoking. Advertisements such as blu Cigs® tout “Take back your freedom with blu Cigs®, the smart alternative to cigarettes.” From NJOY e-cigarettes, “Cigarettes, you’ve met your match. Finally, smokers have a real alternative.” JUUL , arguably the most popular of e-cigarettes, is promoted as the “Smoking Alternative.” JUUL is labeled as the iPhone of e-cigarettes because of its sleek and slim design, which resembles a USB flash drive. JUUL has the largest market share of e-cigarettes in the U.S., having sold 2.2 million devices in 2016 and 16.2 million in 2017. While e-cigarette manufacturers and distributors market e-cigarettes as both a cigarette cessation tool and a healthier alternative to cigarettes, there are no long-term studies that offer this conclusion. And because e-cigarettes have not been around for a long time, there is no research speaking to the long-term impact of e-cigarette use on addiction and health. Various agencies are conducting this research, but the data is years away. Currently, e-cigarettes are not approved by the FDA as a tool to aid nicotine/tobacco cessation. Besides the addictive component of nicotine, research has found e-cigarettes contain harmful ingredients such as formaldehyde, acrolein, nickel and chromium – all of which can cause lung damage. Many e-cigarettes contain flavorings such as mint, cotton candy, cherry, cinnamon and chocolate. While not all flavorings have been studied, certain flavors have been found to produce concerns. For example, cinnamon flavor was determined to contain cinnamaldehyde, which leads to decreased movement of cilia in the lungs, leaving them more susceptible to retaining bacteria and unable to adequately clear airways. Vanilla and butter flavoring have been found to trigger an inflammatory response in white blood cells, leading to concerns about the impact on the health of pulmonary tissue. As the e-cigarette industry flourishes, the rate of teen use is also flourishing . According to the 2018 National Youth Tobacco Survey, e-cigarette use among middle and high school students increased dramatically between 2017 and 2018 (78 percent increase among high school students, up from 11.7 percent in 2017 to 20.8 percent in 2018 and 48 percent increase among middle school students, up from 3.3 percent in 2017 to 4.9 percent in 2018). While previous years showed a decline in overall tobacco use, this trend reversed in 2018, with an increase of 27.1 percent amongst high school students and 7.2 percent of middle school students. In comparison, 2017 North Carolina rates of e-cigarette showed a rate of 16.9 percent of high school students (16.8 percent in 2015) and 5.3 percent of middle school students (7 percent in 2015). 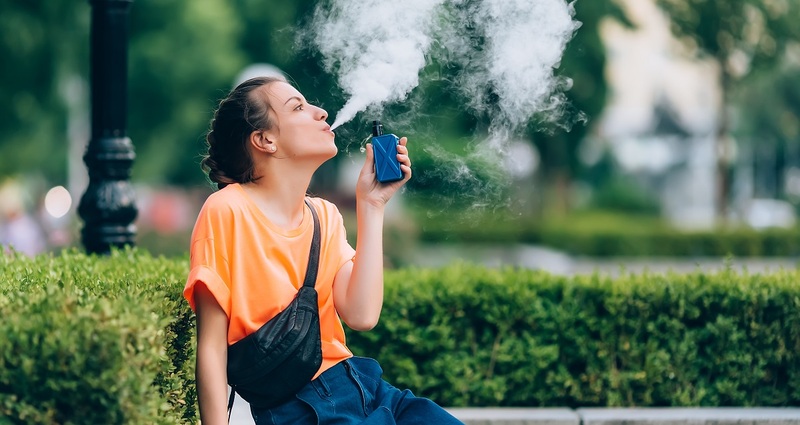 E-cigarette use trends show teens tend to prefer flavored e-cigarettes (68 percent in 2018 versus 61 percent in 2017). The increase of teen use sheds alarming light on not only the immediate risk of nicotine use, but also the potential for nicotine addiction, the impact of addiction on other conditions and the transition from e-cigarettes to other tobacco products. In fact, those who use e-cigarettes are four times more likely to start smoking cigarettes. FDA commissioner Scott Gottlieb, MD, speaks to the concern of youth nicotine addiction: “If we’re to break the cycle of addiction to nicotine, preventing youth initiation on nicotine is a paramount imperative … with the data show[ing] that kids using e-cigarettes are going to be more likely to try combustible cigarettes later.” The Surgeon General concluded that e-cigarette aerosol is not safe, and youth use is considered to be a public health concern. E-cigarettes are marketed in such a way that makes them look desirable and not harmful. For teens whose planning and decision-making center of their brain (the prefrontal cortex) isn’t fully developed until the age of 25, they are highly susceptible to persuasive advertising. When introduced to the brain, nicotine triggers a floodgate of the feel good neurotransmitter, dopamine. If dopamine could talk, it might say this very loudly, “We are feeling good now! You want to keep doing this!” As the youth brain is still under construction and driven more by emotions, the impact of nicotine can lead to a cascade effect on a teen’s developmental processes. The more one uses nicotine products, the more the brain desires and demands the substance. Under the influence of a nicotine-stimulated brain, decision making skills become heightened toward seeking pleasure and reward. This reward-seeking pattern can then impact one’s decision to engage in other substances and or behaviors that seek to support that substance use; this in turn, can lead to the substance use becoming priority over other life factors. It’s highly likely the use of e-cigarettes will place youth at risk for attention-processing difficulties and possible increased likelihood of experiencing depression and anxiety. If teen e-cigarette users then transition to smoking cigarettes, they are more likely to have panic attacks, anxiety disorders and depression as well as being three times more likely to use alcohol, eight times more like to smoke marijuana and 22 times more likely to use cocaine. According to a study conducted by the Stanford University School of Medicine, young people who use JUUL “fail to recognize the product’s addictive potential, despite using it more often than their peers who smoke conventional cigarettes.” The same study showed that teens didn’t understand that addiction equated to them having a difficult time stopping use and continuing to smoke longer than they wanted. The perception that e-cigarettes are less harmful leads to use, and use leads to addiction. Via e-cigarettes, teens are becoming addicted to nicotine early, finding it difficult to quit when addiction sets in and often transitioning to cigarettes later in life. The FDA is prioritizing research and suggesting policies to curb the surging rate of e-cigarette use among teens, policies aimed not only at regulating flavors in tobacco products, but also seeking ways to ensure e-cigarette manufacturers and distributors eliminate marketing and sales to teens. See a comprehensive list on steps the FDA  is taking here. For help with nicotine addiction recovery, call 828-213-5527 to learn more about Mission Health’s Nicotine Dependence Program at missionhealth.org/quit-tobacco . To schedule an appointment with one of our specialists, call 828-213-2222. Helena Theoharis is a licensed professional counselor and certified tobacco treatment specialist with the Nicotine Dependence Program at Mission Hospital. Along with her co-workers, Sharon Rohrer, RRT, RCP, AE-C, CTTS, and Donna Borowski, LPN, CIC, CTTS, the Nicotine Dependence Program seeks to assist persons struggling with nicotine addiction.